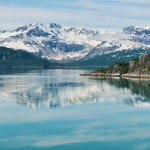 Known as Alaska’s “first city”, Ketchikan is the southernmost city in the state; therefore, it is often one of the first stops on a northbound or roundtrip Alaskan cruise. 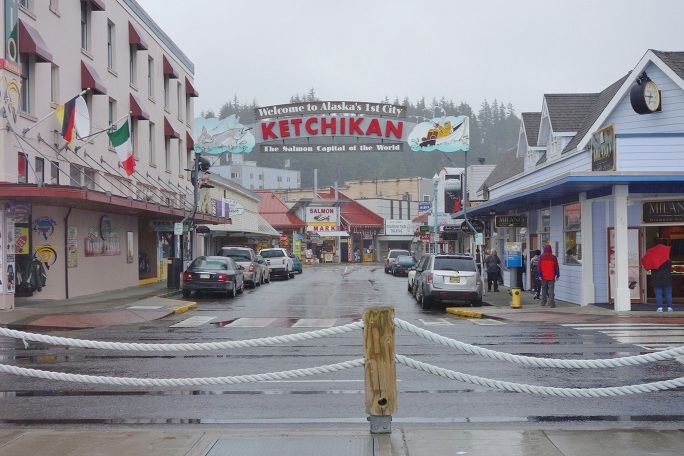 Besides being the closest Alaskan city to the United States mainland, Ketchikan is also one of the wettest locations in the country with an annual rainfall that can exceed ten feet of precipitation! 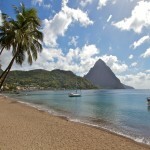 Needless to say, when going ashore at this port of call, you will want to pack a raincoat. You should also pack your camera as Ketchikan has a rich history that you will want to document during your time at this port of call. Among the artifacts found in Ketchikan are authentic totem poles scattered throughout the city. During your travels, you will stumble upon these magnificent works of art depicting various legends and stories of the native tribes. One of these can’t miss totem poles is the Chief Johnson Totem Pole (also referred to as the Kadjuk Pole), a 55’ pole found right in front of the entrance to historic Creek Street. It would be hard not to spot this towering masterpiece during your visit to Ketchikan. Among the natives that inhabited the Pacific Northwest were the Tlingit tribe members. The Tlingit tribe was responsible for many of these original works of art, but contrary to popular belief, their totem poles were not religious artifacts. Totem poles were constructed for many different reasons to include as a memorial to a deceased member of the clan, especially someone of stature or prominence, as a memorial to a significant event or in honor of a celebration, and even to shame members for perceived wrong doing. While the significance of the totem poles varied, the carvings on these Tlingit poles were usually similar and often included depictions of mythical creatures and folklore like the Raven and the Eagle. While totem poles were not constructed to be worshiped, the completion of a totem pole did call for a celebration. With such hard work and dedication put into building these structures, it was tradition to throw a potlatch once the product was finished-a huge celebration where neighbors would bring gifts to celebrate the momentous achievement. Little history is known about Chief Johnson, but what is documented is that he was a wealthy Tlingit leader, who was born in a village near Cat Island. After a falling out with local church leaders, Chief Johnson led a migration of Natives to Southern Ketchikan in late 1887. To honor the passing of his mother, Chief Johnson had a 60 foot totem pole erected in 1901. With reportedly over 500 people present, Chief Johnson threw a lavish potlatch to commemorate the raising of this massive totem pole. On top of this pole sat Kadjuk (the mythical Eagle). To signify this creature’s importance over all other creatures, a 30+ foot section of the totem pole remained uncarved separating Kadjuk from the other creatures carved below. Other prominent figures featured in this totem pole included the Raven, whom legend told helped man capture fire, and Fog Women, a companion of the Raven. Fog Woman is believed to be responsible for the seasonal salmon run. Raised at the mouth of the Ketchikan Creek, the Chief Johnson totem pole was a symbol of the clan’s history, culture, and power. Standing for some 80 years, the original Chief Johnson Totem Pole was removed 1982 due to decay. 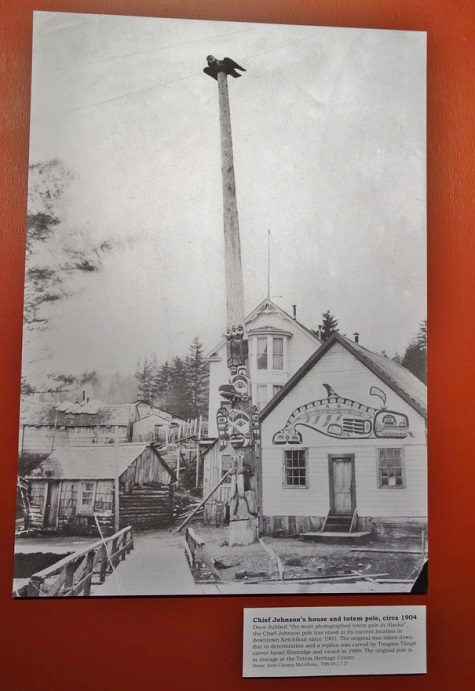 Some remains of this original pole have be preserved and can be seen in the Totem Pole Heritage Center, which is about a 15 minute walk from downtown Ketchikan. What resides in front of Creek Street now is a replica of the original Chief Johnson Totem Pole, which was erected in 1989. This 55’ replica was carved by Israel Shotridge out of a single piece of red cedar. 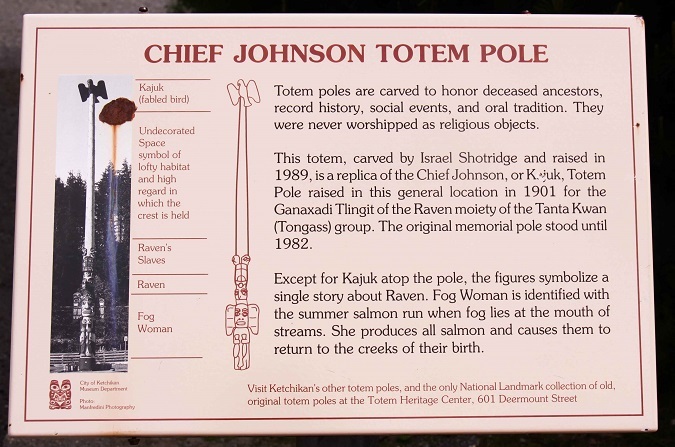 Keeping the design true to the original pole, Kadjuk stays perched on top of the pole with a long division between him and the story of Raven and Fog Woman depicted below. 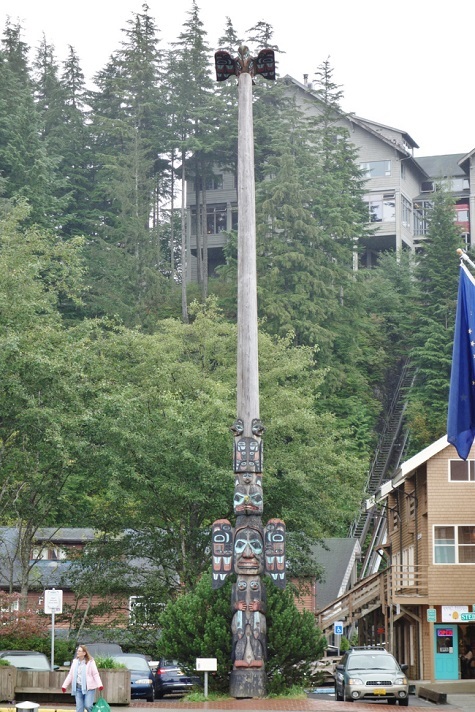 The new Chief Johnson Totem Pole was the first authentic totem pole to be carved and raised in Ketchikan in 50 years. To mark the occasion, a large potlatch was held with natives from all over southern Alaska. Standing only a foot from where the original Chief Johnson pole once stood, this replica captures all of the magnificence and beauty of the original Chief Johnson Totem Pole. Along with the Chief Johnson Totem Pole, there are some 80 totem poles that you can discover as you walk the streets of downtown Ketchikan. 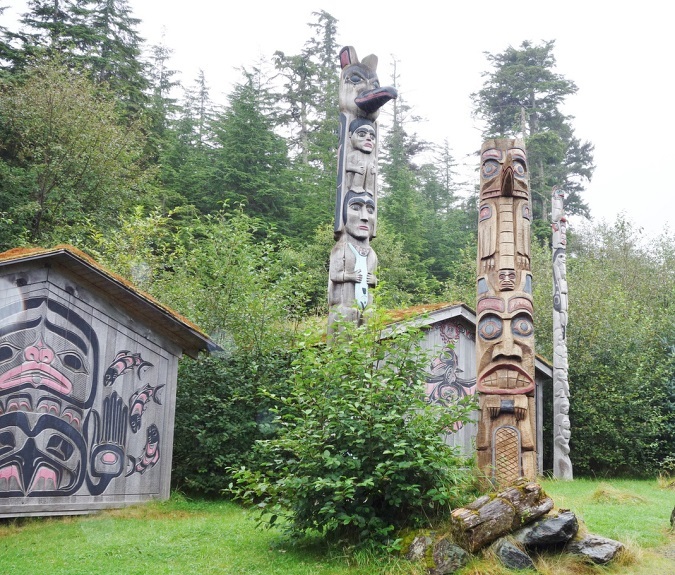 For those who want to learn more about the art of modern totem poles, the Saxman Native Village is where you should head during your time on shore. Here, you can explore one the world’s largest collections of totem poles and learn about the legends behind the various carvings. You can also watch master carvers creating new works. If you are lucky, you may even catch a glimpse of Nathan Jackson, one of the most important Alaskan totem pole artists. 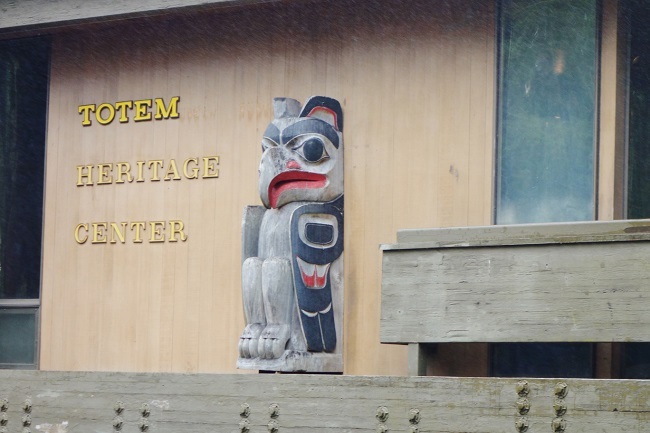 During your time at the Village, you can also learn more about the Tlingit history and people, and view one of the largest clan houses in Alaska. 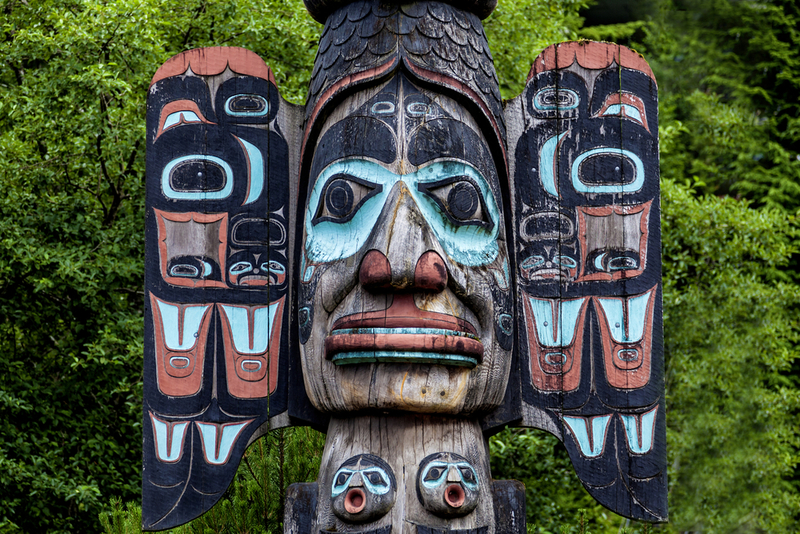 By gaining knowledge of both the ancient traditions and modern approaches to Tlingit art and totem poles, you will leave with a deeper appreciation for these Native people and their intricate artwork. Yes, downtown Ketchikan offers all of the typical amenities you would expect at an Alaskan cruise port- unique shops, eateries, and plenty of places to purchase local salmon. 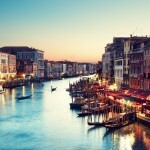 But, we suggest that you venture beyond the port and find a Ketchikan Tour or Excursion! You will quickly discover the history and culture of the Native Alaskan people in the beautifully carved totem poles spread throughout the city, with the Chief Johnson Totem Pole towering over all of them. Grab your camera (and raincoat, of course) and get ready to travel back in time while docked in Ketchikan.